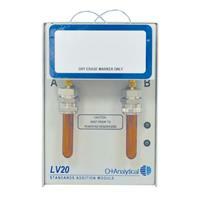 The LV-20 Standards Addition Module pairs with our Model 4551A Autosampler to improve accuracy and precision of GC-GC-MS analyses, while minimizing standard usage and decreasing laboratory costs of expensive standards. Designed as an option for the 4551A Autosampler, the LV-20 Standards Addition Module injects programmed volumes (1, 2, 5, 10, or 20 µL) of internal standard, surrogate, or matrix spike standards to improve the accuracy and precision of GC-GC-MS analyses. The LV-20 is equipped with high-speed injection valves which inject user-programmed volumes of standard with no excess overfill volume that fixed-loop based systems require to operate. All LV-20 functions are programmed using the intuitive touchscreen and Windows® CE software on the Eclipse 4760 Purge-and-Trap Sample Concentrator. 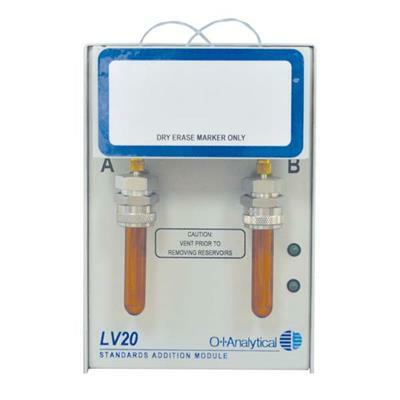 Consider using the LV-20 for these applications: GC and GC-MS analysis of volatile compounds (VOCs), drinking water, wastewater, groundwater, storm water, volatile petroleum hydrocarbons (VPH), oxygenates, 17+ USEPA-approved methods, ASTM and standard methods, and VPH and GRO Methods.